There are many examples of volume discounts as these can have many tiers of pricing based on quantity, or simple buy-one-get-second-half-price deals – take a look at Harry’s razors, and T-Mobile’s latest sale. In this post, we’ll look at a few advantages and pitfalls of offering volume discounts, and how to activate tiered pricing for your Shopify store. Since the per-unit price of the next quantity-bracket of products is cheaper, customers get an incentive to purchase in bulk, increasing your average order value. This is especially true for products that customers have to purchase on a recurring basis, or for wholesale customers. By offering a discount for purchasing items in bulk, you also reward your most valuable customers. These customers get a better experience since the discount creates additional value for them and builds loyalty. Depending on the type of product, by purchasing in bulk, these customers commit to using your products versus those from rival brands. Loyal customers will also create more referrals which can lead to additional sales. Larger orders may be beneficial to you for a number of reasons. If the cost of goods for your products decreases by sourcing them in higher quantities, then you can achieve higher profit margins through scale. Larger orders also help clear inventory, and may be cheaper to ship on a per-unit basis. Although there are a number of advantages for having tiered pricing, this may lead to a few pitfalls if it is not thoroughly researched upon for your store or business. As customers purchase in bulk and on a discount, this creates a lower reference price as the normal for your products. This can undermine the value and utility of your products. The lower reference point can especially be challenging if you remove the discount for any reason, as suddenly, the same customers have to pay the full price. Small purchasers also see the lower per-unit price, and may think that the lower price is closer to the true price of your products. They may think that they are paying a premium for the same products, which can lead to a negative customer experience. If most of your orders end up being on the discounted prices, this can create a major dent in your profits. On the supply side, if your products don’t get cheaper as you scale, then the higher sale volumes may increase your operating costs. This can lead to lower net profit. Before you offer tiered pricing, it is crucial to figure out how the lower prices will affect your bottom line. After doing your research about how volume discounts may change the revenues and cost, you can initiate tiered pricing on your Shopify store using the Quantity Breaks – Tiered Pricing & Bulk Discounts app by Bold Commerce. 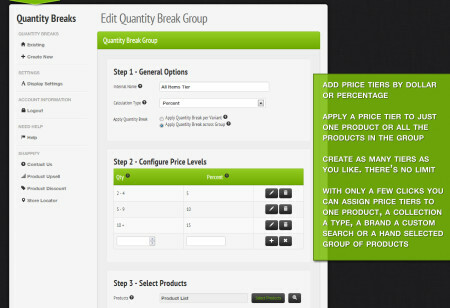 The app allows you to create tiered pricing for individual products, product categories, groups, or your entire store. You can set the break points for quantities, and the type (dollar amount or percentage) and value of the discount for each break. You can customize and choose from different options the layout, text, and styling of the tiered-pricing table. You can configure as many pricing tiers as you’d like. Note that the same product cannot be part of two different collections for the volume discount. 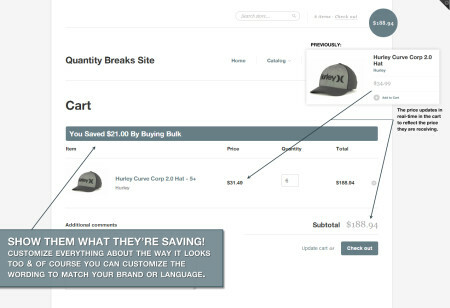 If a customer purchases an item or items that qualify them for the bulk discount, the cart page not only automatically includes the discounted price, but also displays the total savings realized by the customer. Clearly showing this value can create a positive customer experience. The app works by creating a variant for each price price point. So, if you have a product with no variants, and you create three price points (in addition to the single item price), then the three prices are created as variants of that product. Each pricing tier doubles the variants of your products. If you have a lot of variants for your product, this may pose an issue as Shopify has a 100 variant limit for each product. Before you can activate and use the app, you will need to include a little amount of code into your theme files. If you are not comfortable with this, you can ask the app support to do it for a fee. Volume discounts can be a great way to increase your sales and your average order value. The tiered pricing gives customers incentive to purchase items in bulk. 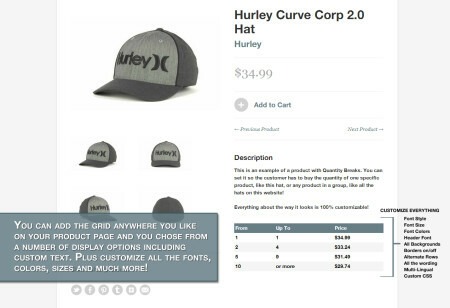 This can be especially helpful for selling wholesale as you display the wholesale pricing on the same page. Although volume discounts have the above advantages, they also come with some pitfalls. Volume discounts can build a lowered-price expectation with customers who purchase things at a discount, which can undermine the value of your products. Another thing to keep in mind is the hit to profits these discounts can create. If majority of your customers are wholesalers or businesses, there is a chance that most of them may start to purchase in bulk for the discount. This can drive your profits lower if the scale doesn’t lower your costs. You can easily display the tiered pricing and give a discount based on volume on your Shopify store using the Quantity Breaks – Tiered Pricing & Bulk Discounts app. You only need to use a little amount of code to activate the app, but there is no coding required afterwards to create or delete pricing tiers and discounts. Do you give your customers tiered pricing? Why or why not? Please tell us in the comments.